Recently returned from a year teaching English in Korea, my friend Kerissa Barron has been introducing me to some of her favorite dishes, including this one, a spicy cold noodle salad, with lots of toppings. It’s known as bibim guksu in Korean, and if you’ve ever had bibimbap, it’s a lot like that, but chilled, and with thinly sliced raw vegetables and a hard cooked egg. The sauce that holds it all together is sweet and spicy and made with red chili paste, rice vinegar, sugar, and sesame. So good! I recommend making extra sauce and just keeping some around to dress up leftovers. The meal comes together quickly, the most time needed to cut up the vegetables. Having lived in Korea, where summers are not only hot but extremely humid, when I think summer, I think spicy cold noodles (bibim guksu in Korean). Also, having grown up in a very hot part of California with a mother who literally forbade us to turn on the oven from June until October, I understand the importance of dishes that require little to no cooking to get us through these hottest of months. However, do not be fooled by the simplicity of preparation. Korean food, and in particular these Korean noodles, are extremely flavorful. Between the red chile paste, sesame oil and rice vinegar these noodles hit all the flavor notes: spicy, sweet, salty, tangy and nutty. Feel free to use the dressing to make any variety of cool summer dishes. It would make a great salad simply by tossing with lettuce or thinly sliced cucumbers, or even being poured over sliced cold tofu or cooked chicken. Do you have a favorite cold noodle dish for hot summer days? Please let us know about it in the comments. Japanese soba (buckwheat) noodles are used for this recipe, which you can usually find in the international section of the grocery store. You can also use somen noodles, Korean wheat noodles (guksu), arrow root noodles, sweet potato starch noodles, or even spaghetti or angel hair pasta. The toppings are flexible as well. Add, subtract, adjust to your taste and availability. 1 Boil water for noodles: On the stovetop, fill a medium large pot with water and bring to a boil. 2 Prep toppings: While the water is heating, prepare toppings and the sauce. Prepare the lettuce, cabbage, cucumber, carrots, asian pear, sesame leaves and radish sprouts. Set aside. Cut each hard boiled egg in half. Set aside. 3 Make sauce: In a small bowl, combine red pepper paste, rice vinegar, soy sauce, honey, brown sugar, sesame oil and sesame seeds. Stir to combine and set aside. 4 Boil, drain, and cool noodles: Once the water is boiling, add buckwheat noodles, or other type of noodles, and cook according to package instructions, or about six minutes, until al dente. When noodles are finished cooking, pour into a colander and rinse with cold water and drain. To quickly cool your noodles you may also place a few ice cubes in the colander or place the drained noodles into the freezer for a short time, just don't forget them! 5 Serve: To serve, place cooled noodles in a medium sized bowl. Top with dressing and vegetables/fruit of your choice. Place one of the hard-boiled egg halves on top and a few radish sprouts. Hello! All photos and content are copyright protected. Please do not use our photos without prior written permission. If you wish to republish this recipe, please rewrite the recipe in your own unique words and link back to Korean Spicy Cold Noodles on Simply Recipes. Thank you! Yummy! Satisfying yet easy enough for a weeknight (with bags of preshredded carrots and coleslaw). i just wanted to point out when you say korean wheat noodle (guksu) – guksu is noodle. so what your saying is korean noodle (noodle). korean wheat noodle is arrowroot noodles or memil noodle. This dish is so easy to make and so pretty. My shortcut is buying a bag of coleslaw instead of a big head of cabbage I would not be able to use up, less chopping ;)I used potato noodle, I like the chewy texture better. Dana — Try using less sauce. The more sauce you use, the spicier it is. Either cut down the amount of sauce you make, or add it little by little until you get the right effect. Also, try eating it with something cool on the side. Cold asian pears are always good! Hi Elise, I understand the pregnancy cravings for htis–great idea with lettuce wraps. I’m going to try it with my next triple batch of sauce (am pg too). Holy hot deliciousness! This was SO good — but SOOOO hot! Maybe we weren’t supposed to mix all of the dressing in with noodles….it was so tasty, but so INCREDIBLY spicy! Kept adding more carrots and lettuce and cucumbers to cut it down. We loved it – might just find a way to take down the kick a notch next time. Combine the soy sauce, sugar, and rice vinegar in a small bowl and stir to dissolve the sugar. Heat a wok or a skillet, add the sesame oil, and heat until hot. Add the ginger, garlic, and red pepper flakes and stir-fry for about 10 seconds, or until fragrant. Add the soy sauce mixture and cook for about 30 seconds, stirring constantly. Pour over the broccoli and toss to coat. Let sit for at least 30 minutes at room temperature or cover with plastic wrap and chill for several hours before serving. Place ingredients in bowl, stir well, and microwave for 30 seconds. Pour over chicken, noodles or your other favorite dish. Thanks Linda! I’m going to try that. In the meantime, thank you Elise and Kerissa for bringing back memories of Seoul and posting this delicious recipe. I have just finished the last of it after three mouth-watering mountains of vegetable salad with some noodles. I will have to triple the sauce recipe because this was so easy to put together with veggies from the fridge and bring to work. My colleagues were very interested and curious about the sauce, which you described so succintly: spicy, subtly sweet, salty, vinegar-y savory and nutty all at the same time. Mmmm! Thank you for posting this!! This is excellent, going to be one of my staple summer meals. I made the sauce exactly as in the recipe and used the vegetables (carrots, daikon radish, cabbage, cucumber, snow peas, spinach) and pasta (brown rice spaghetti) that I had on hand. This recipe would make 6-8 meals for me – to make this leftover friendly, I stored the veggies in one container and the pasta (tossed with two teaspoons of sesame oil) in another. Then it’s all ready to assemble. Lee’s Deli in San Francisco sells a cold spicy noodle dish that I loved, and never knew how to make it. Guess what? Now I do! I followed the sauce instructions exactly, but just used what I had (carrots, broccoli, cucumber, tofu & leftover chicken). Very good! I did add cilantro too. OHMG this is my absolute favorite dish. So surprised to see it in here. It goes really good with cold crisp sliced asian pears. My mom always used thinly sliced onion, cucumber, and carrot, let it sit in the sauce so it kinds of has a pickling marinating effect. I eat this all the time in the summer. Just introduced Husband to it the other day and he about devoured MY bowl of it. For those of you who dislike having all the vegetables in it, you can easily leave them out and just use the noodles, eggs, kimchi, and sauce — or even just the noodles and sauce! — which is my favorite way to eat it. A favorite, and it is so easy to make. Just make enough that you will eat right then, though — it doesn’t really refrigerate well, in my opinion. I made this last night. I used zuchinni noodles instead of soba. Sometimes it’s hard to find ingredients here in Paris but, I was able to find everything except the asian pear just 3 blocks away. This is my new favorite!! Thank you for another great recipe. This one looks incredle! and i do think you did a really good job! :-p btw about the name, I think ‘Gooksu’ is more proper than Naengmyun. (im korean too) For Naengmyun we have special type of noodle(only for Naengmyun) and except that one, we called most of the noodles as ‘Gooksu’ (fyi naengmyun noodle is exetremly thin like angel hair pasta and really hard to chew and cut). Also, Korean ppl called buckwheat noodles as ‘Memil or Momil Gooksu’.Anyway as a big fan of your recipes, I really like you enjoyed Korean noodles and I can’t wait to try your version of Bibim Gooksu! YUM ! These noodles were actually the first cold noodles I ate during my time here in South Korea–I used to shudder at the thought of eating noodles without any kind of hot soup! But these, eaten on a hot day, is beyond delicious! 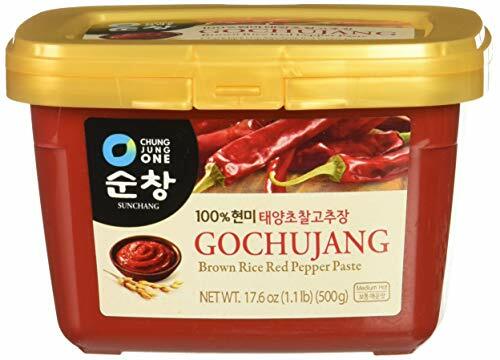 If you want to make this, I HIGHLY recommend buying Gochujang. Without it, the dish will not taste the same! I’m currently teaching for a year here in Korea (signing up for another year, hopefully) and we’re just getting into the hot humid summer. I look forward to trying bibim guksu here along with mul naengmyeon and other beat-the-heat dishes. Yum! Glad to see a recipe available for people outside Korea too! My mom does a version of this dish over which my sis and I drool. She usually mixes the noodles with her gochujang sauce and some kimchi that’s pretty fermented. It’s just spicy enough to make your nose run :). I love asian-style cold noodles and request them at asian restaurants in the summer in the hope of finding a new version; often they are not shown in the English language menu but are usually available (if only as staff lunches!). Particular favourites: Korean Mul Naengmyeon, Japanese Reimen (aka Hiyashi Chuka Soba), Japanese Somen, Japanese Tokoroten, Vietnamese Bun rice noodles served as part of a ‘Vietnamese’ salad. It’s winter here, so it’s hot noodles for now, but I like cold noodles best. These noodles are very good! I believe the recipe came out of Bon Appetit magazine many years ago with a few modifications to make it just what we wanted. This goes great with grilled salmon, chicken or grilled albacore tuna. Toast the sesame seeds in a small skillet over medium heat, stirring, until golden and fragrant, about 10 minutes. Reserve 1 tablespoon of the sesame seeds. Puree the remaining 4 tablespoons sesame seeds with the soy sauce, peanut butter, vinegar, sugar, ginger, garlic, and chile oil in a blender or food processor until smooth, about 30 seconds. With the machine running, add the hot water, 1 tablespoon at a time, until the sauce has the consistency of heavy cream (you may not need all the water). Cook the noodles in 6 quarts boiling water seasoned with the salt until tender, about 4 minutes. Drain and rinse under cold water until cool. Shake out the excess water and transfer to a large bowl. Add the scallions, carrot, red pepper, and sesame sauce and toss to combine. Arrange on a serving platter (or divide among individual bowls) and sprinkle with the reserved sesame seeds.